A painting of a scientist with dragonfly wings and pinned to a specimen card. Artwork for a CD cover for an album entitled The Scientist. Commissioned by the scientist, pictured. A painting of the mother of a client. 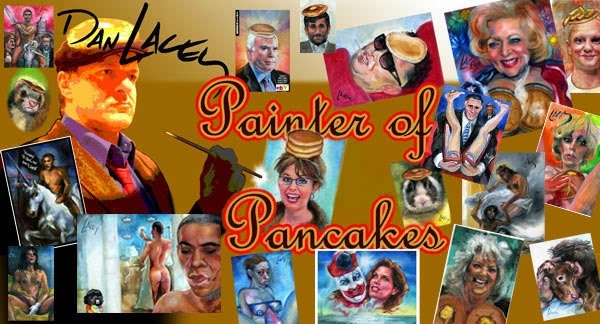 A miniature oil portrait of Republican Presidential candidate John McCain with a pancake on his head. A miniature oil portrait of racehorse Eight Belles, running her last race. This original piece of equine racehorse art is 4 by 6 inches in size, painted in oil on a canvas sheet. Inspired by a photo taken during the Kentucky Derby. A previous Eight Belles painting can be found at my Eight Belles Kentucky Derby post. A miniature oil portrait of a white Arabian horse. This original piece of equine art is 4 by 6 inches in size, painted in oil on a canvas sheet. A miniature oil portrait of Gus, current winner of the World's Ugliest Dog Contest at the 2008 Sonoma-Marin Fair. Gus has lost one leg so far to skin cancer and an eye to a tomcat. Otherwise, he's feeling fine. A painting of Canterbury Park champion and 2004 Oklahoma Derby winner Wally's Choice, riden here by Luis Quinonez and owned by Wally the Beerman and Curtis Sampson. Click image above to view larger Wally's Choice painting. Click for larger Fox News cartoon. Neverborn in a Fox News story 'stillborn baby comes back to life at cemetary' cartoon. Just a new 'Barack Obama just wants the aborted to truly live for once' cartoon, on the subject of abortion, featuring Timothy A. Bear and Neverborn, the aborted baby turned angel. A parody video I made of the current M. Night Shyamalan eco-horror film The Happening, which features hapless human beings committing mass suicide as a result of vengeful plant farts. An anti California Gay marriage cartoon....gone awry. Larger John McCain Loves Abba cartoon. Republican Presidential candidate John McCain loves the Swedish pop group ABBA. The Wally's Choice oil continues. I'll post a pic of the completed canvas by Monday. Had a chance while I was painting to meet David Evert, organizer of the ongoing '1,000 years of Minnesota History' mural project in Wadena, Minnesota. Each mural is painted in the shape of a puzzle piece and then installed on various buildings throughout Wadena; when completed the project will constitute the world's largest picture puzzle. Perhaps when David's project is completed we can coax the talking Paul Bunyan at the nearby Brainerd This Old Farm to amble over and terrorize the picturesque town of Wadena in a misguided although hilarious attempt to reconstruct the entire puzzle in the local Wal-Mart Supercenter parking lot. Watch Paul lose his patience and use his mighty axe to make the &%$# puzzle fit together. You can help fund the mural project by taking a tour of the Alley Arts studio the next time you pass through Wadena. An oil painting in progress at Minnesota's Canterbury Park of racehorse Wally's Choice for Wally the beer man. This painting is further along than pictured, with more than half of the acrylic underpainting completed. Should have this completed by Father's Day on Sunday. My art studio in the front lobby. Click above to view larger Barack Obama Scarlett Johansson Bill Murray cartoon. Bill Murray tries to warn Barack Obama against exchanging emails with Scarlett Johansson, but his message gets Lost In Translation. Worthy of a follow-up cartoon I may never get around to, which would feature John F. Kennedy stuck in a Groundhogs Day-like timewarp with Marilyn Monroe. I'm a Bill Murray fan, so I hope his current divorce mess comes to some sort of amicable conclusion. A new miniature oil of Oolong, the bunny who wears a pancake on its head (actually, he sports a double stack.) My third and most detailed painting in this continuing series. A previous painting of Oolong is currently #1 in a Google image search of pancake bunny, bunny rabbit with a pancake on its head, and Oolong the bunny (all with 'safe search' on for some reason,) toping hundreds of copies of the original images which inspired the paintings. Many times these small oils end up ranking very high in Google image search categories. Your winning bid may truly become a collector's item. A revision of my painting from last week, featuring Barack Obama riding a unicorn. A miniature oil painting of Paul Newman, actor, director, former race car driver and founder of Newman's Own, as food company founded for the sole purpose of funding charities. One of these charities includes The Hole In The Wall Gang, a camp for children with cancer. The name is taken from the Paul Newman / Robert Redford film Butch Cassidy and The Sundance Kid. Paul Newman is a WWII veteran who served in the Pacific theater. Earlier this year, he celebrated his fiftieth wedding anniversary to wife Joan Woodward. They have three daughters. A miniature oil painting of President George W. Bush dancing. Inspired very loosely by this video of President Bush dancing at the White House during Malaria Awareness Day. That's to Scheherezade at Something Awful for inspiring this 'Ted Kennedy's tumor proves my point that liberals are made of cancer' cartoon. I have a new Big Brown painting currently on auction on Ebay. The auction ends on Friday, April 10. New Big Brown Painting - Ebay Art Auction. A miniature oil portrait of a big brown horse, similar to the one who recently lost his bid to become the first horse racing triple crown winner in thirty years. Better luck next time. This painting was actually part of a previously posted larger canvas which also didn't turn out as planned. However, I was able to save this section of the painting, which in my biased opinion makes for a pretty nice miniature. The color and depth is more impressive than pictured here. Yes, this is the Big Brown, but there are lots of big brown horses in this world. This could be almost any of them. I have my hands full painting at Canterbury on the weekends, so my current modus is to post most of the miniatures on Sunday or Tuesday for either a five or seven day auction culminating on Sunday. Some of these paintings do end up selling for one dollar, which works out for me because I try to make a certain average for all paintings sold. A miniature oil portrait of a current Russian Federation Prime Minister Vladimir Putin. Second painting I've done on this theme and incorporating a different pose. The skin tone isn't quite as green as it seems here; I'll try to post a better image. Click above for larger Mr. ACLU Ferret cartoon. The underdrawings for a matching set of Big Brown racehorse paintings, which are progressing swimmingly. In this photo you can make out the graph I sometimes draw on the canvas to plot out the dimensions of the subject. Big Brown tries for the triple crown at Belmont today. Pencil sketch for a two part cartoon in progress featuring Barack Obama, Faithmouse and Neverborn, and using as a tableau the recent theft of a Jesus statue from Messiah Episcopal church in Detroit, Michigan. In this photo you can see my TinTin mousepad and Camp Snoopy mug. The sketch is being drawn with a Winnie The Pooh pencil, pictured. Drawn while wearing Spongebob boxing shorts. Photo unavailable. A painting of Canterbury Park champion and 2004 Oklahoma Derby winner Wally's Choice, riden here by Louis Quinonez and owned by Wally the Beerman and Randy Sampson. Click image above to view larger Wally's Choice painting. My studio in the front lobby of Canterbury Park Racino in Shakopee, Minnesota. Miniature equine art of Big Brown. A recenty completed painting of probable Preakness and triple crown winner Big Brown. Oil on canvas, 16 by 20 inches. A commissioned oil of jockey Kent Desormeaux riding number twenty postition Big Brown to victory in the Kentucky Derby. This piece of horse racing artwork is also sixteen by twenty inches, painted on canvas. Both were painted at Canterbury Park racetrack in Shakopee, Minnesota. The Barack Obama Victory Unicorn. I'll be selling these to the crowd outside the Xcel Energy Center in St. Paul Minnesota later tonight. A real-time video; I paint an acrylic underpainting for a new Eight Belles memorial portrait, similar to the miniature oil I auctioned on Ebay a few weeks ago. I'd also love to see the steps you use to paint a painting if feasable, from start to finish - the beginning drawing, the different layers, etc. Even though it's a different medium, it's still painting, and I think I'd learn a lot from looking at this. Wish I'd wore a hat. Similar equine paintings and portraiture can be seen at my front lobby studio at Canterbury Park racetrack and card room in Shakopee, Minnesota. I'm painting during race times. Art studio in the front lobby of Canterbury Park racetrack and card room in Shakopee, Minnesota. Behind the easel you can see two paintings in progress of probable future triple crown winner Big Brown. Hillary Clinton, Jim Morrison of the Doors sitting in the bathtub, Puerto Rican Muppet Rats, and Parisian Neverborn-the end. A miniature memorial oil portrait of Tootsie director Sydney Pollack. Thanks to Simply Streisand for linking to the Sydney Pollack painting. A cartoon of late actor Heath Ledger, who played both a Gay cowboy and The Joker. Previous 'memorial coloring page' cartoon. Please visit the Faithmouse Megathread at Something Awful to view similar past paintings. Bambini!! MSN LiveSpace page - Heath Ledger as The Joker art. A miniature oil portrait of a smiling Palomino paint horse.